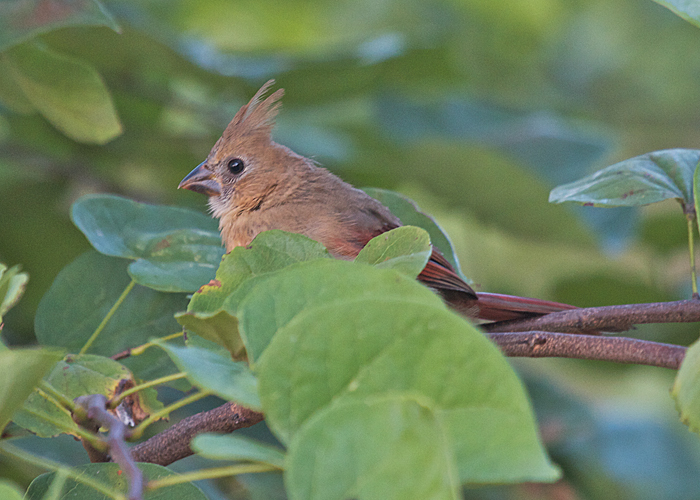 A young cardinal peeks out of the redbud tree. 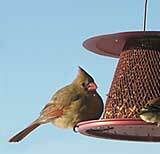 Adult cardinals have bright orange-red beaks, but the beaks of the young are gray as steel. Over the next few weeks we'll watch this baby's bill turn bright as her those of her parents. It's called the No-No Cardinal Feeder, because it says NO to squirrels, who can't get at the seeds through the all-metal feeder. Cardinals love it. And so do chickadees, titmice, nuthatches, and woodpeckers.